One of the most popular footballers who have been members of the Heart of Midlothian Club passed away on Friday when Paddy Crossan died in an Edinburgh Nursing Home. It was in 1911 that he joined the Tynecastle club; and he never left them, and was a Heart for some 15 years. He was born at Addiewell in 1894, so that he was still in his teens when he joined the Hearts. Earlier, he had played for Addiewell Celtic, Seafield Athletic, and – like Willie Wilson – Arniston Rangers. He was a first team man right away – Boyd, Crossan and Currie. 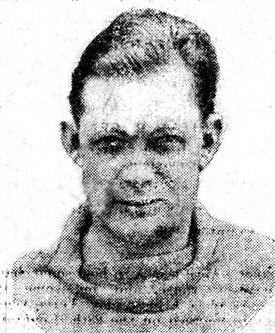 By 1915 he was among the “caps”, being honoured by the Scottish League against the Southern League. Then came the war, and Crossan, along with the rest of that great Heart of Midlothian team, joined the Colours. In France, he was wounded in the foot and gassed, but no end to his football career was brooked by Crossan, and he came back to Tynecastle to delight the crowd with his own inimitable back play. In 1920 and 1921 he was given benefit matches by his club. In the first game, on a dull evening, 10,000 people attended, and in the second, the crowd approached 12,000 – sure proof of his popularity with the Edinburgh public. After his retirement he was identified with public-house management in the city, and retained the friendship of many people well-known in the football world. He was always a personality on the field, and there was no resisting the gay abandon of his play. How the crowd loved his mammoth kicking, his daring interventions, and his flying tackles! He was breeziness itself, and many a time his dauntless courage inspired a jaded Hearts team to renewed efforts. The funeral took place on Tuesday from St Mary’s Cathedral, Broughton Street, to Mount Vernon Cemetery. Midlothian Advertiser, 5 May 1933, page 4. This page was added by Sybil Cavanagh on 13/04/2012.